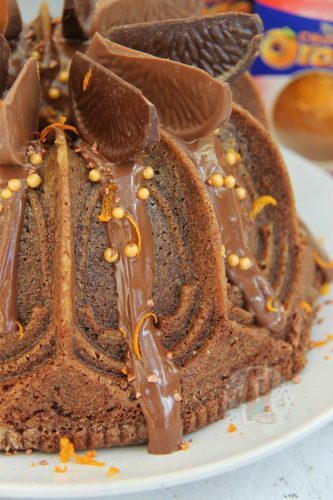 Chocolate & Orange Zest Bundt Cake with Chocolate Orange Drizzle, and a dash more of Terry’s Chocolate Orange! 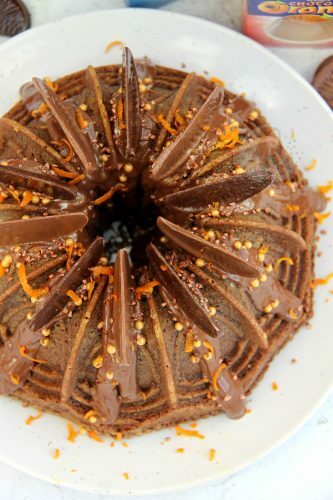 I have put up a few bundt cake recipes in my time now, including a chocolate one, but something about Chocolate & Orange together is a marriage made in heaven. My recipe for my Chocolate Orange Cookies is amazingly popular, and is one my boyfriends absolute favourite cookies ever! After the success of the cookies, I thought I would develop a Cake version that would be perfect for Afternoon Tea, or just a Cake for the week! 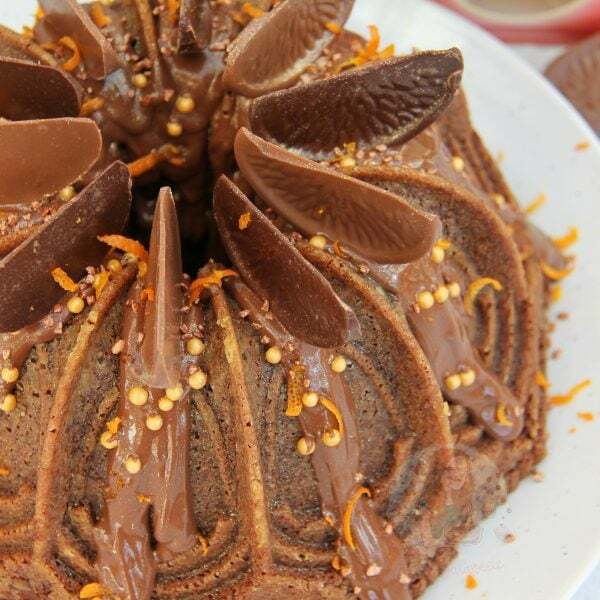 This cake has a delicious light and moist sponge even with the flavouring – using cocoa powder gives you the flavour of the chocolate without making the cake too dense, and the orange gives it a nice citrusy zing! I find that this recipe is easy to follow, and is totally worth it in the end! 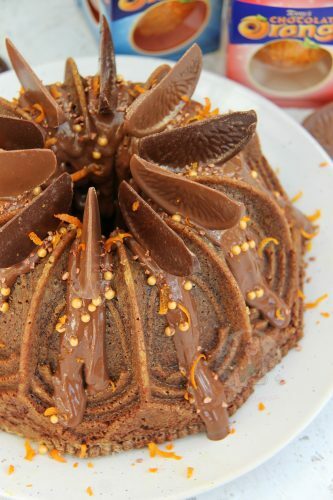 I spent ages researching into chocolate bundt cake recipes, even looking at my own, but I wanted to try something else – this one is perfect for the orange flavouring! I hope you all like it too! You can use a simpler cake recipe by using 350g of Stork, and Caster Sugar, with 7 medium eggs, and 300g Self Raising Flour, and 50g Cocoa powder, and bake for 55 minutes at the same temperature! For this Cake, I used the Nordic Ware Cathedral Cake Tin, as I just thought the shape of it would also suit the segment shapes. You can use simpler cake tins or other Nordic Ware Bundt Tins, but this size is the correct size. In Nordic Ware terms, its a 9 Cup Batter Tin. I just think using Nordic Ware tins makes things so much more special! People often struggle with bundt cakes as they come apart in the tin, or they don’t come out at all. There are a variety of ways you can prepare them such as cake release spray, or melted butter and flour, or just butter and flour… but I prefer the ‘low-fat oil spray’ you can get for cooking these days, and then a tablespoon of flour on top and coated. I then bake my cake, make sure there are no bubbling sounds coming out of it, and poke it with a skewer to make sure its baked fully. Leave the cake in the tin for 10 minutes and then turn it out onto a wire rack to cool fully! Sometimes cakes can get a little stuck, but leave it with the cake bottom side down, and wait to see if gravity helps! At the end of the day, if you didn’t grease it enough, it might just get stuck. 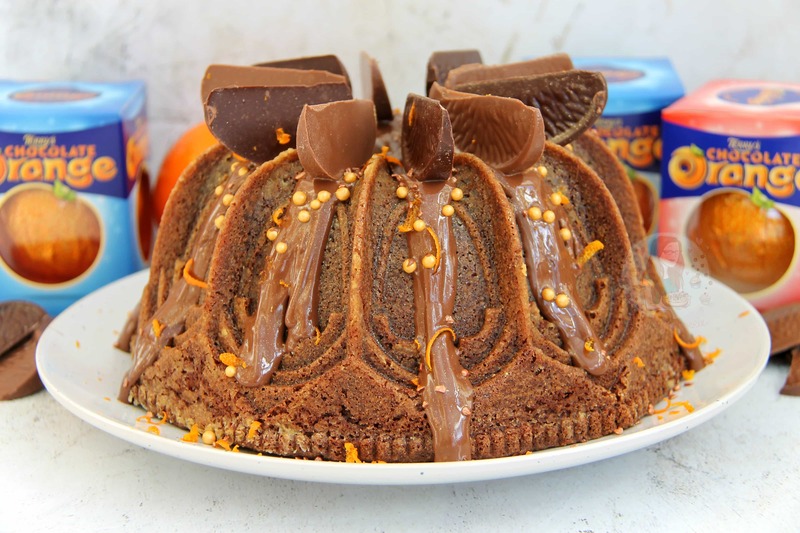 Terry's Chocolate Orange Bundt Cake! Preheat your oven to 180C/160C Fan and grease and flour a Bundt/Ring tin well – Mine was the 9 Cup Nordic Ware Vaulted Dome pan!! Mix the Cocoa Powder and Water together and stir until a smooth paste is formed, leave to the side. With an electric mixer, I used my KitchenAid, Mix the eggs, vanilla, and butter together with the cocoa powder mixture for 1 minute until combined, make sure to scrape the sides of the bowl half-way through to catch everything. With the mixer on a low speed, add the self-raising flour, sugar, orange zest, and baking powder and mix until combined. Pour into the tin and bake in the oven for 45-50 minutes until risen and a skewer comes out clean! Leave to rest for 10 minutes then turn onto a wire rack to cool fully. 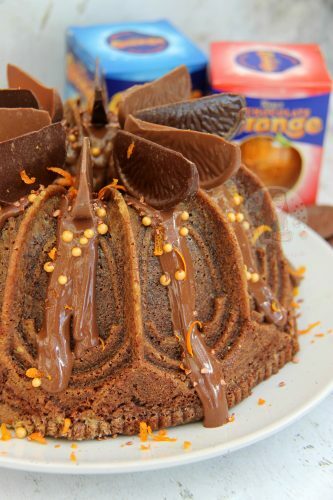 Once the cake is cooled, Melt the Terry’s Chocolate Orange, and drizzle it over the cake. Add on a few chocolate orange segments for decoration, and some sprinkles, and orange zest. Serve, and eat it all! I have often covered this cake with a chocolate orange ganache, but I find the melted chocolate is delicious enough as it has so much flavour! 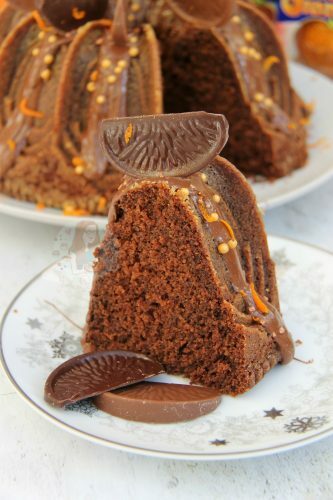 I sometimes put in chopped up chunks of Chocolate Orange into the cake as well, but I wouldn’t put more than 1 as it might moisten the cake too much and make it hard to get out of the tin! This will last in an airtight container for 4-5 days at room temperature! I used the 9 Cup Nordic Ware Vaulted Dome pan!! Older Next post: Cornflake and Malteser Rocky Road! Newer Previous post: Peppermint Truffles! Looks fabulous. Is it possible to use melted chocolate in this cake rather than cocoa powder? I sometimes find cocoa powder makes a cake dry. I made this cake and took it on holiday. My family loved it! Perfectly moist. 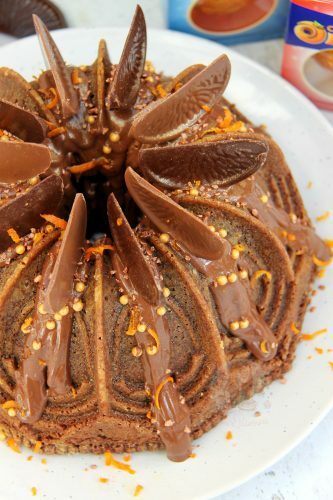 I keep seeing recipes for chocolate and orange, it must be the “IT” combination of the season, and for good reason! They really are a match made in heaven 🙂 Looks delicious! Thank you! And I agree, it’s like a sort of obsession at the moment, but I’ve always loved it! So creative! This looks great. Thank you so much! And combining flavours is so good! If that was possible I think I would be the happiest person on earth haha, thank you! Oh my goodness! My mouth is watering, this looks amazing. Thank you so much!! 🙂 it was so delicious! Ok, I will bring the tea and I will order an extra large slice haha. Have to have my vitamin C!? YES I love that excuse! I will use that from now on! Brilliant! Hahaha Good health comes first!??? Oh wow! I could do with a slice of this and a nice cup of tea!